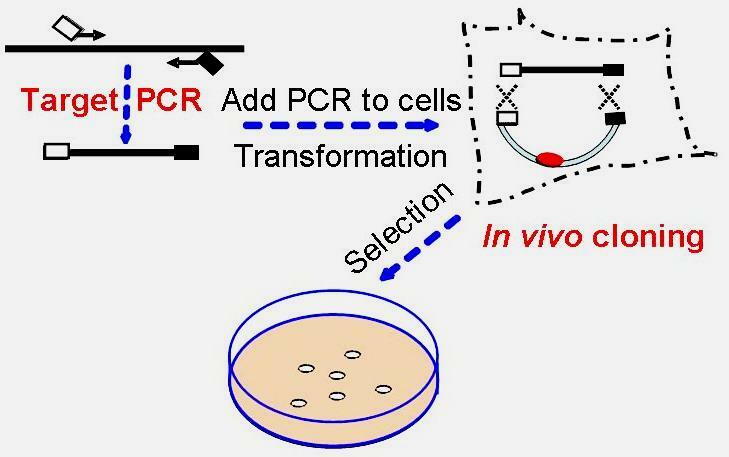 PCR Cloning has never been easier! GenTarget’s revolutionary proprietary Fusion in vivo high throughput Eco cloning technology (patent pending) is the easiest PCR cloning method available for making E Coli expression clones. It utilizes an engineered E Coli strain with enhanced homologous recombination machinery for cloning PCR products. A specific vector is already built into the cloning cells for an in vivo end-joining reaction. A proprietary processing technology ensures low background and a > 95% positive cloning rate. Simply amplify your gene of interest with a primer pair that is flanked with a short arm homologous to the expression vector, then add 1µl of purified PCR into the engineered, ready-to-use cloning cells, and immediately proceed to transformed. There is no need to purchase either the expression vectors or competent cells. The optimized E Coli or mammalian expression vector is already built into the cloning cells. You just select the cloning cells having the built-in vector that meet your needs. This extremely easy PCR cloning method also eliminates the labor intensive and sometimes troublesome vector preparation procedures of other cloning technologies. No in vitro tube reaction is required (such as ligation, Topo TA cloning, or In-fusion reaction). Let E Coli do the job for you in vivo! For E Coli expression, the protein is expressed from either a T7 based or non-T7 based vector, depending on the cloning kit. For expressing toxic proteins, please select our basal level self-controlled PCR cloning cells (Cat: IC-1003).